July and August are prime Mexican bean beetle times. 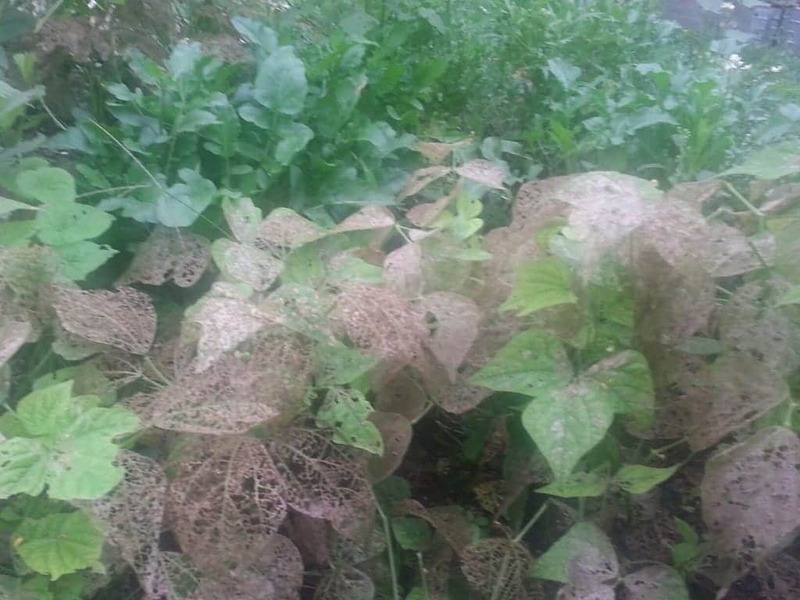 They can leave your bean plants looking like lace. Sadly, this is a common occurrence across Georgia during the summer months. 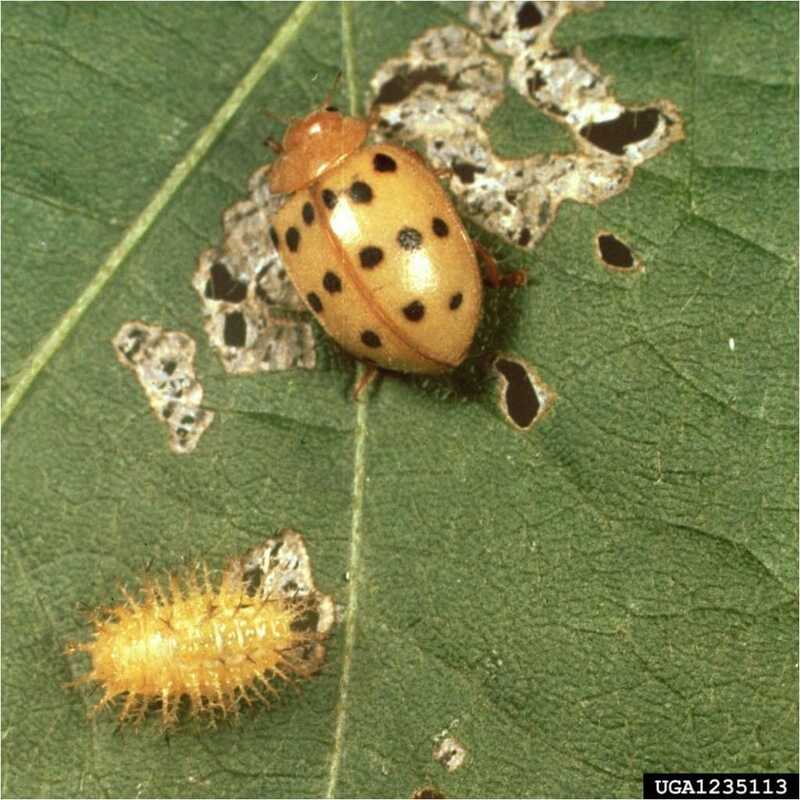 As with any pest, it is best to learn a bit about the biology of the Mexican bean beetle so you can better control the damage. Adult beetles, which look a bit like lady beetles, overwinter in garden debris. Cleaning out your community or school garden plots could help. Keeping nearby ditches clean could also help. The beetles emerge in the warm temperatures of spring and look for young beans, soybeans, and lima beans. The adult female will feed on the underside of leaves and will lay 40 or more yellow eggs also on the underside of leaves. Pest scouting needs to include looking at the underside of leaves. 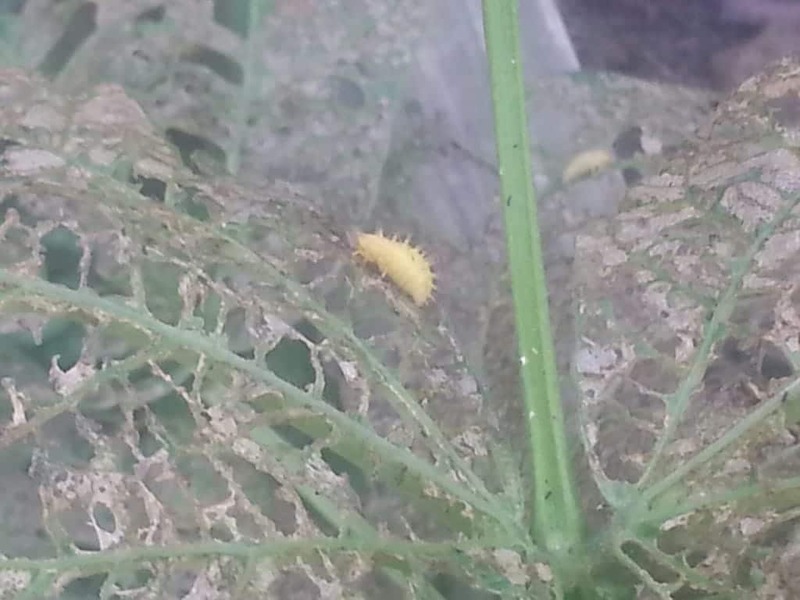 If you can catch the pest in the egg stage simply remove the leave and dispose of it away from the garden. 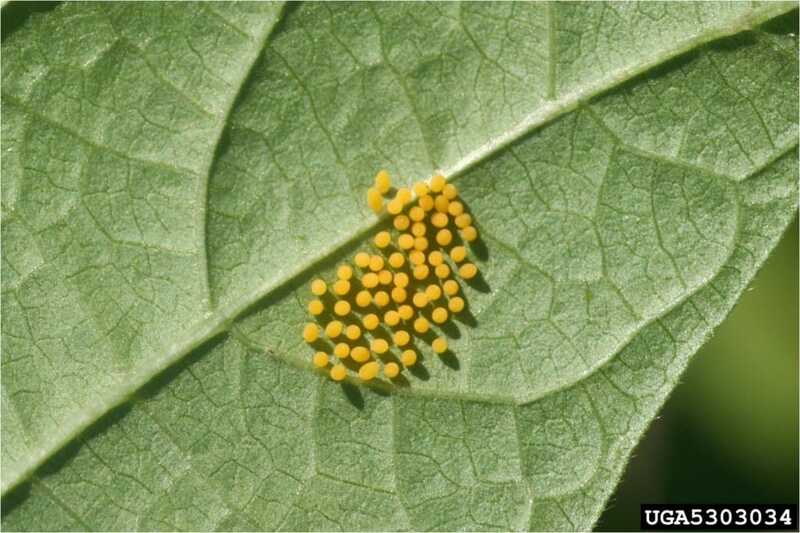 Once eggs hatch the larvae begin eating from the underside of the leaves. They will feed for 2 to 4 weeks and do alot of damage before they pupate on the plant. There are usually 3 to 4 generations per year. If you see just a few larvae, crush them by hand. Larva on what is left of a bush bean plant in a Georgia community garden plot. For preventative control, try planting your bean crop as early as possible. The Mexican bean beetle likes the very warm temperatures of summer and if you can get a quick maturing bean variety planted early, you may outsmart the pest. The wasp Pediobius foveolatus is a Mexican bean beetle predator. However, it does not overwinter well here and you would need to purchase these insects – not really worth the investment for a small crop of beans. Adding plants that attract beneficial insects is always a great idea. Some serious bean gardeners plant a trap crop of beans. Theses are planted to the side of the main garden. When the trap crop beans are under attack, the gardeners destroy those bean plants and the insects. Then the gardeners can put in their main bean crop hoping they have eliminated the Mexican bean beetles in their area. Other bean enthusiasts use floating row covers so the flying beetle can’t get to the crop. For this to work make sure you don’t have garden debris left under the row cover so you aren’t just trapping the Mexican bean beetles in with your beans! Once the plants have been seriously infected you can think about chemical control. Contact your local UGA Extension agent if things get that bad in your bean patch. For more information North Carolina State has an informative flyer about the Mexican bean beetle. Wishing you a Mexican bean beetle free year! Happy Gardening! At home and the community garden we have seen the beetles. Luckily, there were only a few larvae and beetles.